Metal halide and actinic lighting - 1/28/04 Hi to the experts that can shed some light, <Maybe> What is the average life expectancy of a 175MH bulb run on a conventional ballast. <The approximate time depends on the bulb but the average is about 12-15 months> Or, when should they be changed to avoid color shift? <same> I have read anywhere from 6 mths to 2 yrs! <Two years is extreme maybe at most 15 months but that is very extreme> I realize there is variations with the brand, ballast, temperature etc, <Yes> but with all things being equal what would be a good estimate. <I think 12-15 months is about right> Also If I run 2 175MH 13k, is it necessary to supplement with twin 96 Watt actinics or is that to much blue? <the actinic color is more for the human aesthetic aspects than for actual coral coloration or growth. Not to say that there isn't some benefit to your corals but for all intents and purposes, it is minimal. We do not use them in the Monterey Bay Aquarium coral tanks or grow out tanks, nor do I use them in my tanks> Should the CF be more like a 10K or even 6500 for good all around coral growth? <If for coral growth, then I wouldn't even worry about CF/PC at all. Save the money! Either use 10K metal halides or a mixture of 6500 and 10K. If you don't like the look then add the CF/PC actinics. I personally feel the 6500 and 10K bulbs look more natural to the true reefs I have had the pleasure of diving in. Hope this helps. ~Paul> Thank you for your assistance. Lighting Question (1/22/04) Help! <I'll try.> after reading the articles & FAQs on lighting, I'm still having a hard time figuring out what configuration of bulbs I should use on a 4x96 W PC hood for a 125 gal (22 inches deep) tank. I would like to grow soft corals and LPS. I believe the fixture comes with 2 10000K white and 2 7100K blue. <actinic> Is this a good combo, or just what the manufacturer wants to get rid of? which bulbs & how many of them should I switch out for actinics? <none> Is 1 actinic is enough? <Actinic is merely aesthetic. Not beneficial from a photosynthetic standpoint. I'd just keep the bulbs you have. 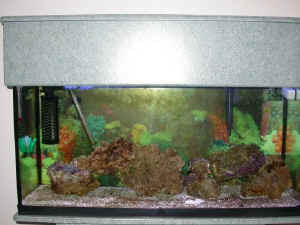 If you don't really like the blue, replace with 10K whites.> if so, won't all the actinic light be on one side of the tank? (sorry if this is a dumb question). what to use for the other lights? keep both 10000Ks? or switch out for 6700 or 8800? <I'd stick with either all 10K or half 10K half actinic. Be wise in your choice & placement of low- to medium-light corals and you should get by with 4X96W. Be sure to learn the feeding requirements of each.> Any light you can shed would be greatly appreciated! Beth <Hope this helps. Steve Allen.> Choosing The Right Light! Hello Crew!!! I love your site! A lot of great info! <Glad that you enjoy it! Scott F. with you today!> I have a 55g FOWLR at this point due to my poor lighting. My LFS sold me a 55w 50/50 36inch when I setup the tank. I'm told that that is sufficient for the Tomato Clown, Yellow tang and couple of Damsels that I can't catch to take back. <Well, not a problem for fishes, but for photosynthetic invertebrates, it may fall short...> I am thinking of upgrading to an Icecap 430 or 660 w/ 2 95w VHO actinic white and 1 95w VHO blue lights. I want to get some anemone's, softies and maybe some LPS. Is this sufficient lighting for them to be happy? <Well, VHO lighting is great stuff, but for optimum health of anemones, you'd be best putting your $$ into metal halides, IMO. Sure, VHO will work fine with many corals, but halides offer greater flexibility, if you ask me (and you did!). I am told that this lighting setup would be at the low end of the spectrum. Is this true? <Well, again- it depends what you're keeping. Plenty of people grow SPS corals with nothing but VHO, but in very shallow tanks. Again-for the anemone, I'd recommend halides> That would be 340w,which is 6w per 1g. I thought that 5w per 1g was sufficient for a successful tank. <Honestly, I don't think the "watt per gallon" rule is really applicable to reef tanks, at least in general. Thousands of watts of the wrong kind of lighting will be, to borrow an Anthony Calfo analogy- as useful as the keys to a thousand cars in an empty parking lot...It really depends on the animals that you intend to keep, and their specific needs. Utilize spectrum and wattage of lighting that is most appropriate> If you have any other suggestions, I would greatly appreciate them. My budget is slightly limited. I'm looking to spend less than $300. Keep up the good work!!! !